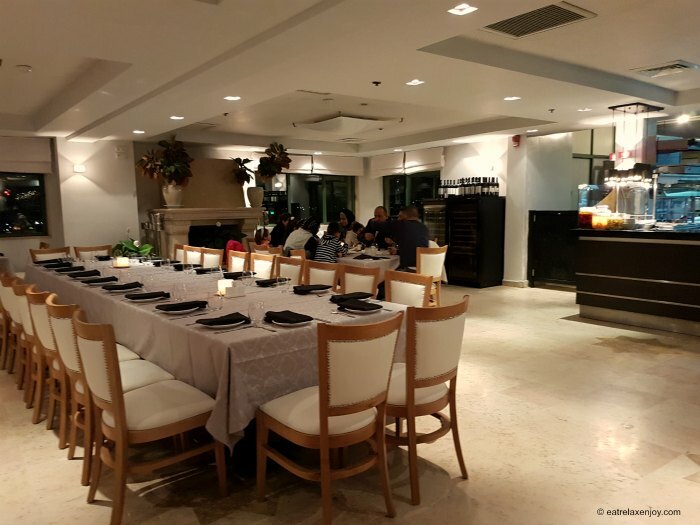 Cardo Restaurant Jerusalem is a Mediterranean Fusion Chef Restaurant featuring Chef Johnny Goric, the Palestinian Master Chef. 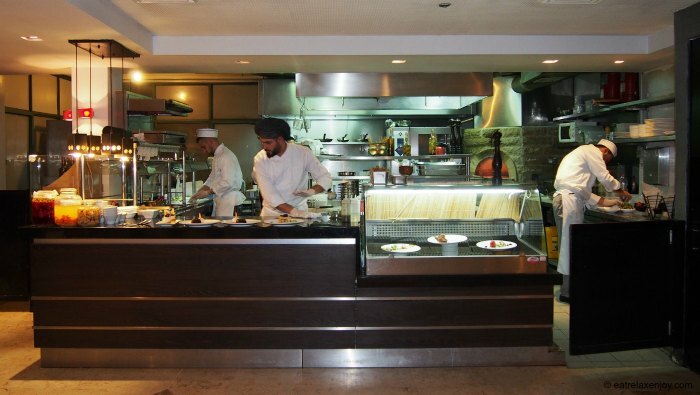 The restaurant’s menu is varied and includes Mediterranean dishes, local up-to-date Arab dishes, Italian, French, etc. The restaurant serves poultry, beef, lamb, fish, seafood, and many vegetables – all from local ingredients. The presentation and service is impeccable, and the prices are attractive! If you’re lucky, you’ll see here Tony Blaire, and other celebrities who eat there. 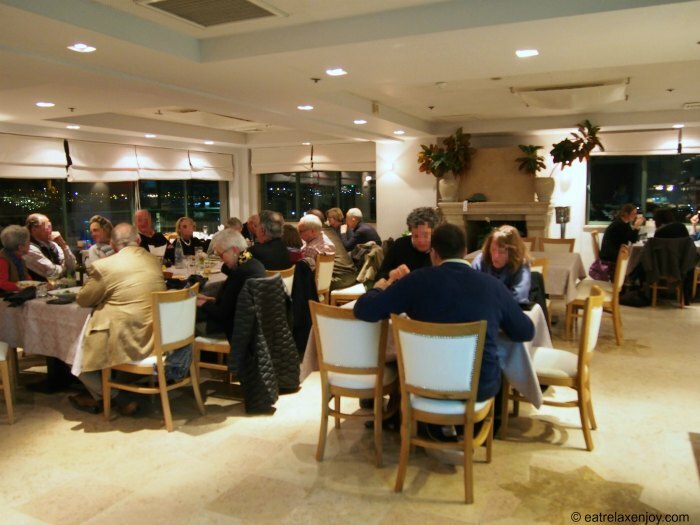 Cardo restaurant is located on the 5th floor of the Jerusalem Legacy Hotel, on the Green line – the border between Eastern and Western Jerusalem. It is spacious and pleasant and has windows to a Jerusalem view and the open kitchen. Here’s a picture of the restaurant. Décor is simple and elegant. The open kitchen is on the right hand side. The open kitchen is a great show of chefs in action, which is quite fascinating to watch. Nevertheless, we did not hear nor smell it, the acoustics and the ventilation in the kitchen are perfect! 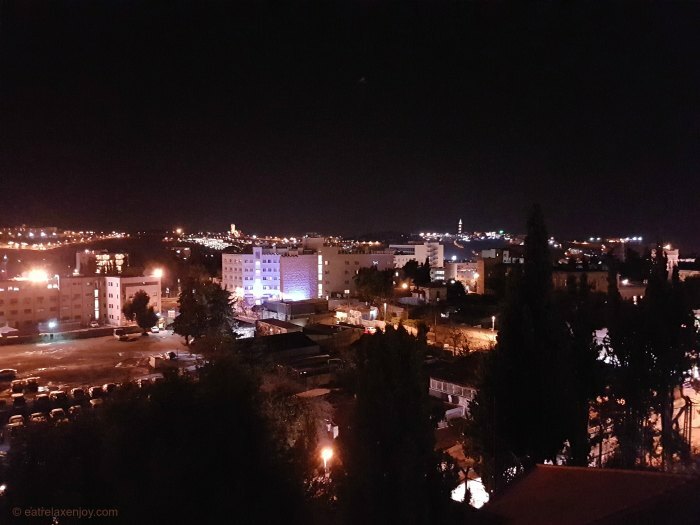 The restaurant has windows to the Jerusalem view – both east and west, which is the main décor here. The menu is in English and Arabic, although the staff speaks also Hebrew and some French. There is a wide cocktail and wine menu. So let’s move to the food. Platter of hummus, eggplant salad, walnut Tabbouleh (bourghul with parsley, mint, lemon and olive oil) with walnuts, pasteli, and Lebanese Kubbe (stuffed pastry). This Mezza is a must-have if you like Arab dishes, it is a great sampler of a variety of salads and Kubbe, excellently made! 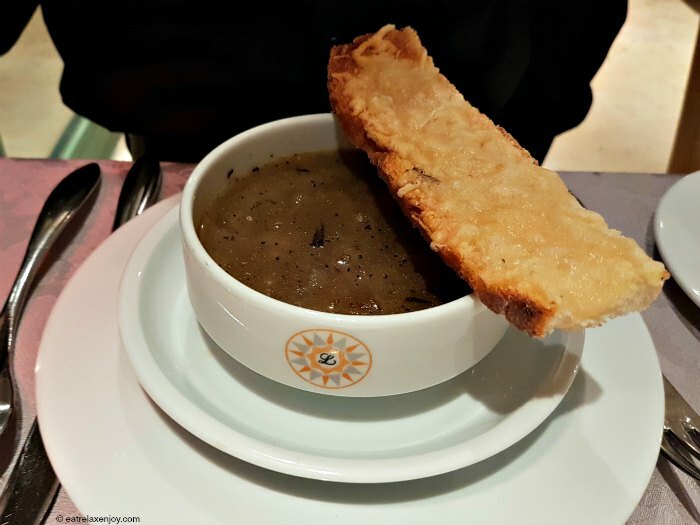 A thick brown soup with rich onion taste, served with a cheese toast. Somewhat salty but very good. 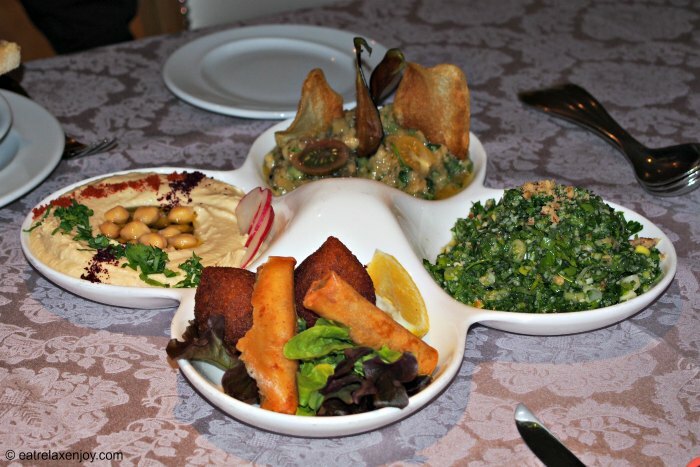 A sampler plate made especially for me (the menu includes a separate plate for Akawi, and one for the mushrooms). Akawi cheese is a local Arab cheese, very salty, and it is served here fried, on black eggplant and herbs. This was combined for me with mushroom stuffed with cheese. The dish is a beautiful plate showcasing Chef Johny Goric’s touch – looks like a picture and tastes accordingly. The cheese is very salty but fits well with the salads in the sampler. Beef medallion and lamb rack, served chef style with red wine sauce. 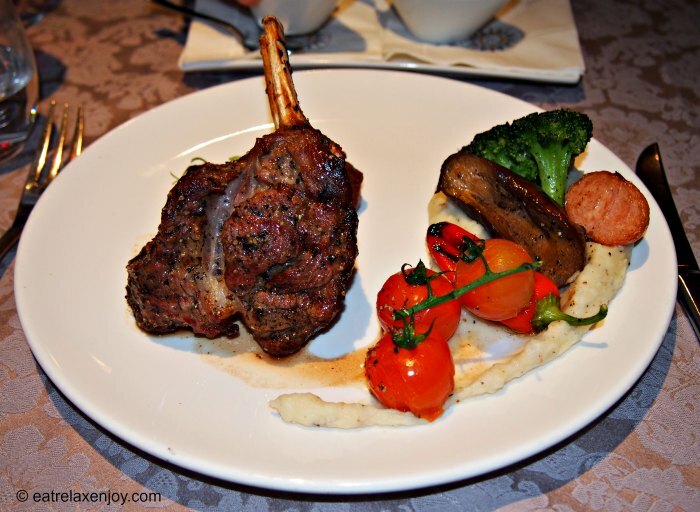 A very large portion of soft pink lamb rack served with seasoned mashed potatoes and miniature antipasti vegetable. This plate is very local and delicious. I ate it with mushroom sauce and it was very soft and tasty. 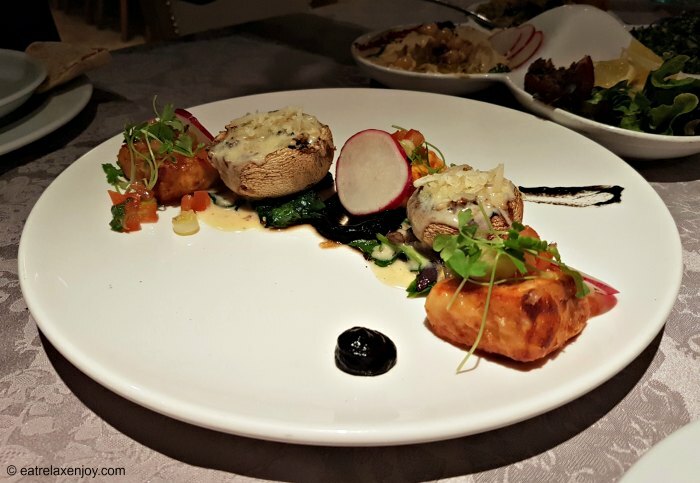 Fillet Mignon grilled to perfection and served with a choice of sauce – pepper, mushroom, or Roquefort sauce. The presentation of this dish, like the Chef’s Duet, is fantastic, and the steak was made accurately pink and soft. 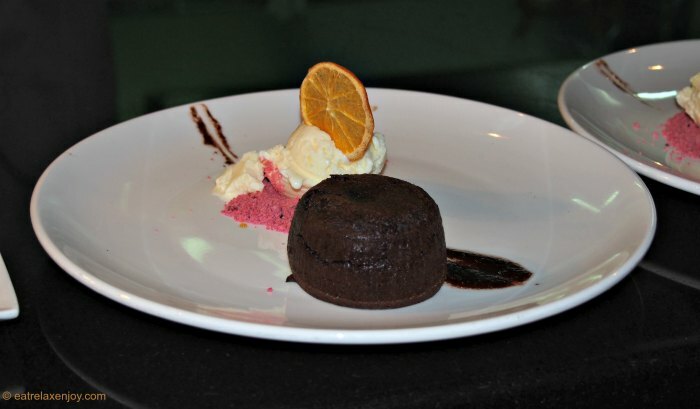 Warm chocolate cake with a juicy middle, served with vanilla ice cream and pink cookie crumbs. 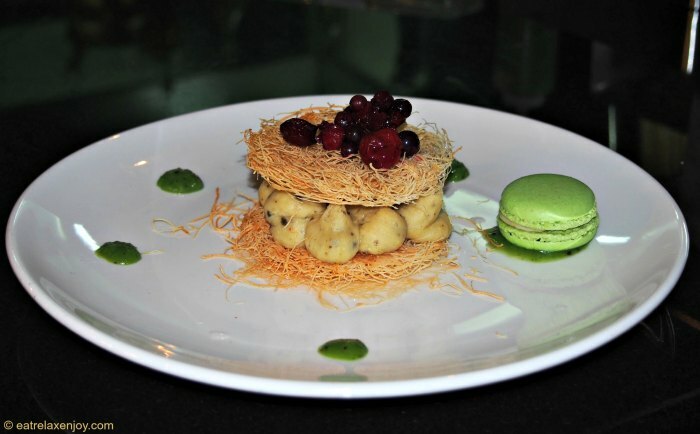 Angel hair dough served with cream of pistachio infused with rose water and wild red fruits. This dish is a must have! Not only that it is beautiful and unique, it tastes like heaven! The combination of flavors is fantastic! 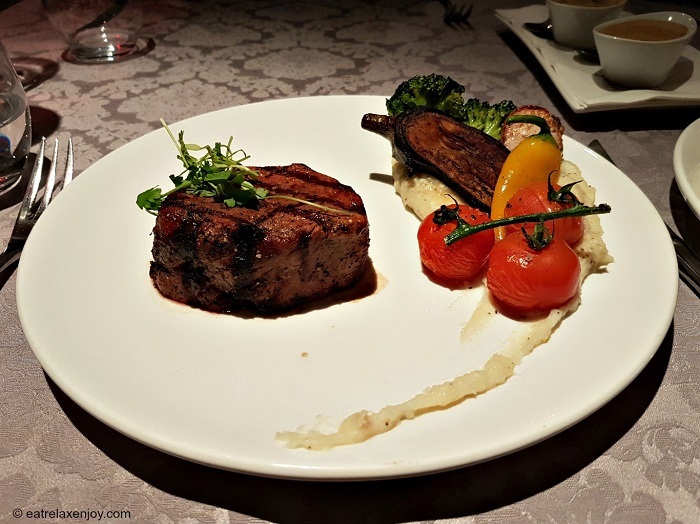 The prices of the restaurant are moderate, which makes it a real bargain for a chef restaurant with high standards, beautiful presentation, a richness of tastes, and excellent service! Don’t miss the Mezza sampler and the Osmaliye (Cream Kanafe).